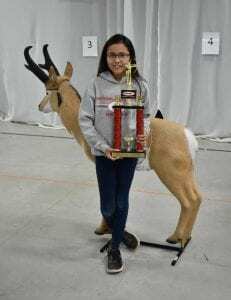 Cheyenne River was well represented at the NASP 3D State Archery Tournament in Brookings, which took place on Friday, March 29. Nineteen schools participated in the tournament including Cheyenne-Eagle Butte and Tiospaye Topa. Also competing was Eagle Butte homeschool student Hope Shorty. The C-EB Middle School Team, who had 17 archers, placed second with a score of 1487. The C-EB Elementary Team, who had 14 archers, placed third with a score of 1207. Tiospaye Topa High School’s six archers had an accumulative score of 1164, resulting in sixth place. Tiospaye Topa also sent three eighth graders who competed individually: Derek Bianas (scored 187), Michael Rousseau (scored 138), and Ashton Charger (scored 124). 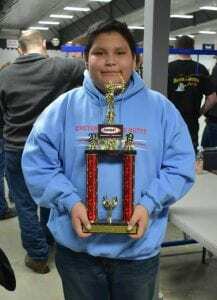 C-EB Middle School had two top 10 archers: Seventh Grader Braylee Yellow Owl placed first in the boys’ category and second overall in the Middle School Division with a score of 268. Seventh Grader Brock Ducheneaux placed seventh in the boys’ category with a score of 257. C-EB Middle School Seventh Grader Tiana Johnson placed seventh in the girls’ category with a score of 251. Top scoring boys from C-EB Elementary were Fifth Graders Luke Lesmeister, who placed fourth with a score of 231; Kael Dupris, who placed fifth with a score of 229; and Russell Thompson, who placed seventh with a score of 216. C-EB Elementary girls’ team had three archers place in the top ten in their category. Fourth Graders Taya Johnson, who placed seventh with a score of 177; Xikannie Hein, who placed ninth with a score of 159; and Wicahpi Pay Pay Frazier, who placed tenth with a score of 144. Eagle Butte homeschooler and former C-EB student, Hope Shorty, fifth grade, placed first with a score of 246 in the Elementary School girls’ category and second overall in her division. When her name was called, the announcers stated that it was the first time in the event’s history that a homeschool student placed in the state tournament. 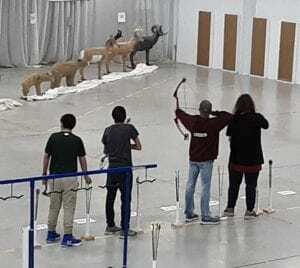 As of press time, Cheyenne-Eagle Butte coach Krissy Joens could not confirm whether the middle school and elementary school teams would complete at the NASP National Tournament that will take place in Sandy, Utah next month. Last year, the elementary team place second at the national event.